Product prices and availability are accurate as of 2019-03-15 08:11:55 EDT and are subject to change. Any price and availability information displayed on http://www.amazon.com/ at the time of purchase will apply to the purchase of this product. 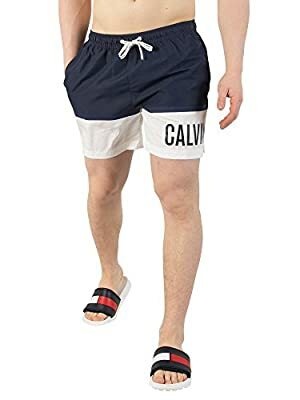 From Calvin Klein comes the Medium Drawstring Swim Shorts in Blue Shadow colour, featuring branded drawstrings and a printed logo on the left leg. With open side pockets and a velcro back pocket, these swim shorts sport an elasticated drawstring waistband and a mesh lining. Calvin Klein Blue Medium Drawstring Swim Shorts. Brand New and Genuine. We are an authorised seller of Calvin Klein. See product description below for more information.